I'm a sucker for a good piece of pie. 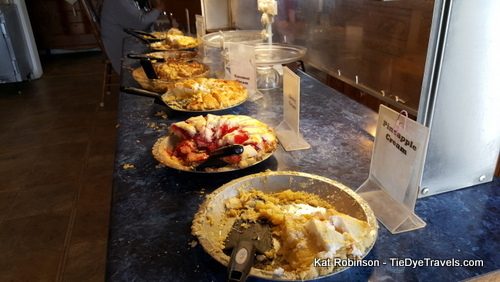 Having several pie options will always get my attention. 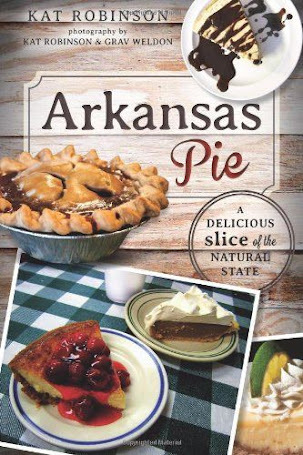 All-you-can-eat pie? I've just fallen off my chair. Cafe in Winslow. The little place has been around a long time, but it hasn't always been Grandma's House. Except it has. Wait, what? See, back in 1991, Ernestine Shepherd opened the Blue Bird House Café right next to a scenic overlook on US Highway 71. Being on the east side of the road, its clientele often included Razorback fans heading north on game days. After all, Highway 71 was the busiest way to get from Little Rock to Fayetteville back in those days. 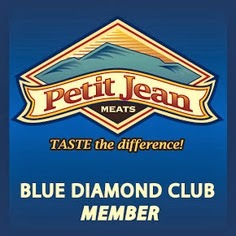 The richly blue painted building drew drivers off the road for good country-style vittles. For ten years it was a staple, but bad health forced Mrs. Ernestine to close the place down in 2001. The traffic drawn away by I-540 when it opened in 1999 didn’t help matters. 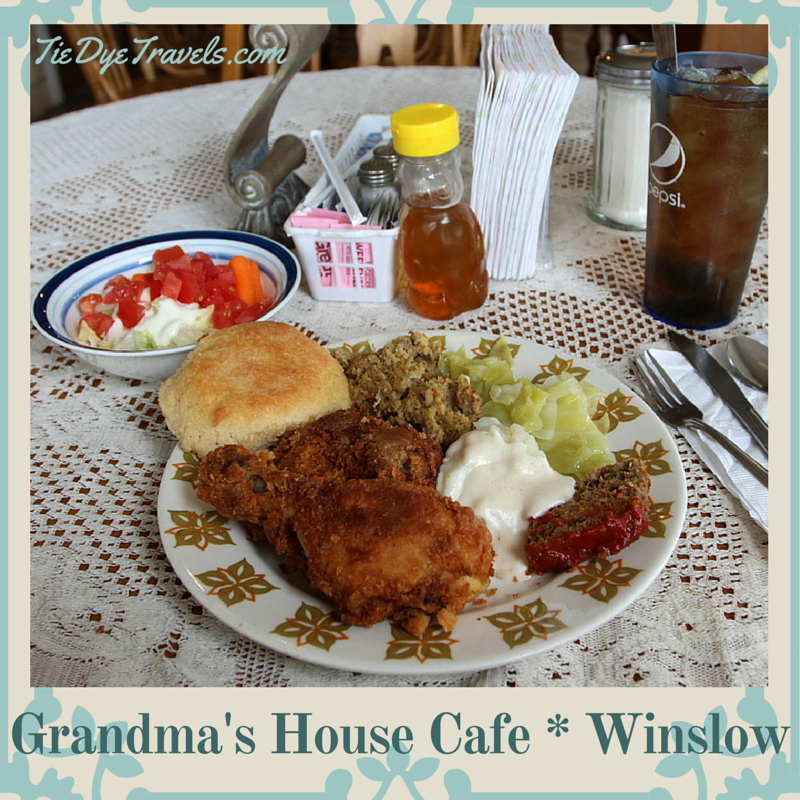 Eventually Mrs. Ernestine decided to put the Blue Bird House Café up for sale – and she had a buyer right off the bat – her own daughter, Elaine Bowlin. Elaine and her husband Jerry renamed it Grandma’s House Café, under the idea that Elaine wanted the place to feel like eating at your grandparent’s home. They painted it gray and they've had to expand it a couple of times. 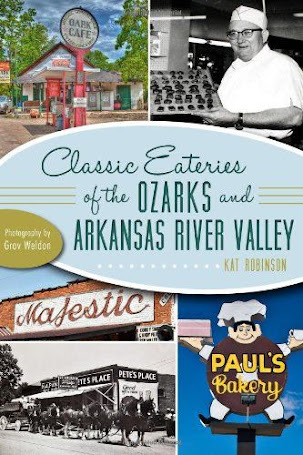 The Bowlins serve up the foods of the Ozarks four days a week on a classic country-style buffet – breakfasts of baked ham, fried bacon, sausage, eggs, fried potatoes, biscuits, white and chocolate gravy and pancakes cooked to order. 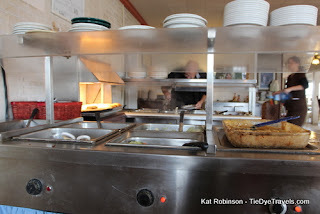 Lunches are also buffets and they come with a variety of possibilities, including ham, pan fried chicken, chicken fried steak, meatloaf, pork chops, barbecue chicken breast, meatloaf and some of the best chicken and dumplings you’ve ever had in your life. 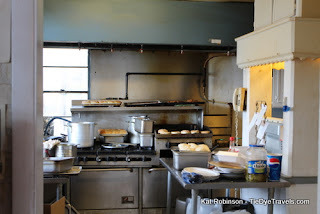 You’ll always find mashed potatoes, cream gravy, green beans, corn and brown beans, and amazing yeast rolls. I dropped in at Grandma's House Cafe one Thursday afternoon for a sustaining meal before a long trip. It was about one in the afternoon, and if there had been a rush, I sure didn't see it. I took a photo of the view before going in. Though the season meant no leafy trees in the valley below, I found beauty in the blues, grays and browns of the undulating hills beyond. Just inside the door, I was greeted fondly by a hostess who directed me to sit where I like. She suggested a table for four, a lace-covered round dinette beside one of the front windows. She also directed me to have what I wanted from the buffet, unless I really wanted to look at a menu. I had no idea Grandma's House Cafe ever offered a menu, but I wasn't even tempted. The buffet looked good. The offerings for the day were plentiful -- with both fried chicken and chicken dressing, meatloaf, mashed potatoes, three different types of gravy, peas, beans, corn, squash, fried cabbage, bright yellow squares of cornbread, green beans and so many other good things. There was also a small salad bar, a station for hot rolls and of course the pie buffet. And even with all that, there was in the corner a stand where a cobbler and a chocolate cake stood. 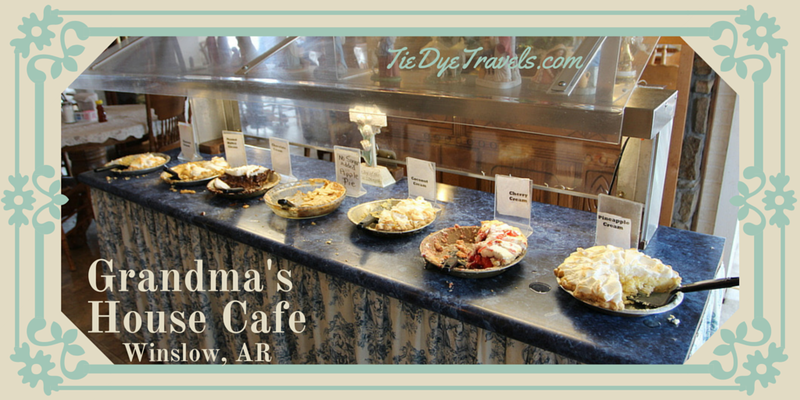 It's very overwhelming to decide on what to eat at Grandma's House Cafe. Much like the family dinner at Thanksgiving, the choices are widely varied and there are big spoons everywhere, and what is one to choose? Unlike at commercial big buffet operations, the setting here with all its ancient china cabinets, linens, mismatched chairs and quaint family heirlooms encourages one not to waste food. Maybe it gives one the idea that someone will admonish them for not cleaning their plate? To be honest with you, the variety of foods is not what I recall encountering at either of my grandmothers' houses, except on holidays and the occasional Sunday lunch when a preacher had been invited to dine. I suspect if I had been exposed to so much food at that point in my life, that I might not have exited adolescence and have died happy from too much amazing and rich food. small piece of meatloaf, mashed potatoes with white gravy, fried cabbage and chicken dressing. This food's the sort of stuff you should be getting from time to time at home, or at your parents' or grandparents' home. If you are deficient in such vittles, a visit to Grandma's House Cafe is in order. The fried chicken had that great buttermilk and flour flavor, where someone actually took the time to carefully place each piece in a hot skillet and turned it when it should be turned. The meatloaf was nice, compact and with the proper amount of ketchup on it (it may not have been my favored honey-cumin-brown sugar-ketchup combination, but I can live with that). And oh golly, I really needed the buttery fried cabbage -- it's been so long. I should fry cabbage at home, but it tastes far better than it smells sometime. And here's where I have to get onto Grandma's House Cafe. See, there's the chicken dressing. My grandmothers, neither one of them, made dressing like this -- but my mom does, and I have never, never, NEVER encountered it elsewhere. I want to know who coerced the recipe out of my mother, because dang it, that was my birthright to have it FIRST, right? The chicken dressing would never be mistaken for that strange Yankee concoction called "stuffing." This is a proper dressing with bits of sage and parsley and other herbs amongst the cornbread crumbled into its liquid base. Okay, so maybe Grandma's House Cafe isn't using grits like my mom does, but it's DANG close. If I didn't mention the pies now, you'd wonder if I'd taken ill or if someone else had snuck into this blog. The pies... of course the pies are magnificent. They're all homemade. And I don't mean thrown into a commercial pie crust. I actually overheard kitchen conversation about taking the crusts out of the oven before they got too dark. 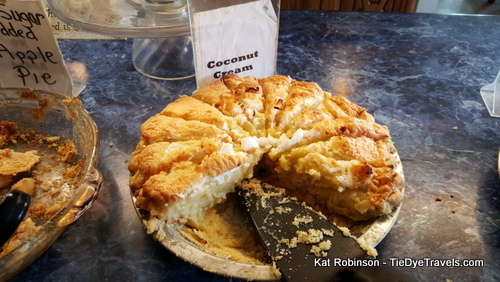 This particular day's offerings included a no-sugar-added apple pie and a variety of cream pies -- coconut, peanut butter, chocolate, pineapple and cherry, each topped with an ample light, frothy meringue. I went with one of my favorites there, the pineapple cream, and a bit of the cherry cream. In both cases, these were real cream pies -- no cream cheese here. The rich, eggy, decadent custards provided perfect balance between buttery crusts and light meringue tops, the pineapple incorporated throughout in its slice, the pie cherries floated atop the custard base on that slice. I wanted some chocolate and some coconut too, but I have just one stomach and that just wasn't going to happen. My kind hostess actually came by as I was daintily trying not to eat both half-slices of pie and suggested I try the chocolate cake, since it had come out very good that day. I had to resist. It was so hard, but I did. There were perhaps a half a dozen diners in the restaurant while I was there, but I saw few of them and heard little, thanks to the cavernous stretches of dining room that extend to the back of the cafe and out to its side, twice. But I do recall visits to the Blue Bird House Cafe when I was younger on game day weekends, and I suspect on such weekends today, even with all the seats available, it'd be standing room only. The buffet is $7.75 during the week, $8.75 on Saturday and $9.45 on Sunday... and the breakfast buffet is $6.95. Do be sure to take cash, since Grandma's House Cafe does not take plastic. And do give yourself plenty of time to eat, because there's no rush at this lovely little place. 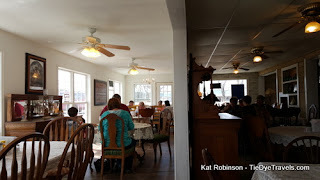 Hunter and I decided Grandma's House Cafe was the perfect place to dine on Thursday on our epic road trip along US Highway 71 from the Louisiana border to the Missouri State Line. Now, I know the word has gotten out about Grandma's House Cafe since this original story. But I had no idea how popular it would be. The entire house was packed, front to back. We waited for a seat. Now, most kids would be thrilled to have some ham or a chicken leg or the like for lunch. Not Hunter. She balked at all the meat choices and pouted until I started filling her plate with broccoli, cauliflower, carrots and pickles, fresh tomatoes and stewed green beans. She turned her nose up at mashed potatoes with gravy and shook her head at macaroni and cheese. 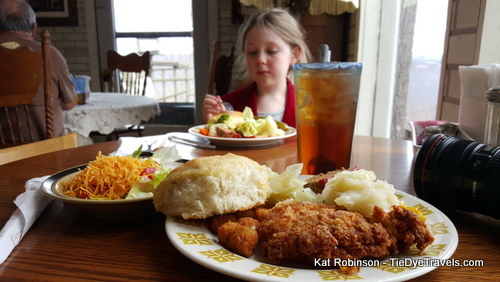 This Arkansas girl just wanted some vegetables, and she got them in force at Grandma's House Cafe. That, and the rolls. Oh my goodness, those yeasty rolls. Once she had downed that second plate of vegetables she tore into a couple of rolls and looked like the cat that ate the canary. So much, in fact, that she initially turned her nose up at pie. Well, that didn't last long. I went and got a sampling of the pineapple cream, cherry cream and coconut pies and got an extra spoon, and soon she was sneaking bites off my plate. She napped all the way to Terra Studios. Thanks for the heads up. We will definitely give this a try. How fun! I definitely want to visit! We are a family of 11, do you remember if there's a spot large enough for us all to sit together? Definitely. Even if you don't all fit at the same table, there are sections where a good 20-30 people could easily sit together. Mmmm... good ole country home cookin'. And close to Devil's Den? I'm in! Now I need to figure out where Winslow is...sounds great like good comfort food! 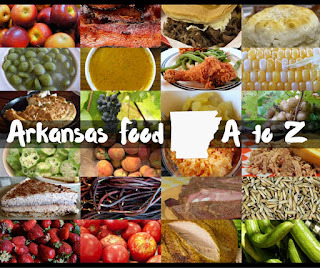 Based on Kat's recommendation, I took Hwy 71 from Alma and stopped at Grandma's House on a trip to NW Arkansas last Friday. 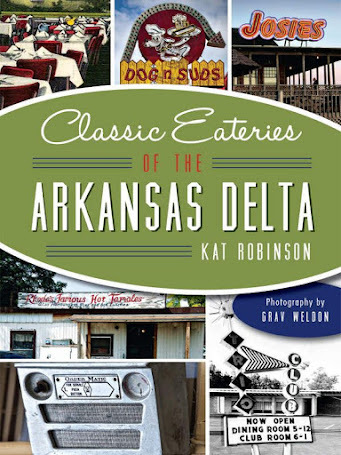 The all-you-can-eat entrees that day were chicken-fried steak, chicken & dumplings, and ham. The lady told me they do chicken-fried steak every Friday. It was all good. But the pies. I think I could make dessert just of the crusts. Definitely not from the freezer case. I sampled the chocolate, peanut butter, and banana cream pies, and all were as fine as anything my mother or grandmothers ever made. 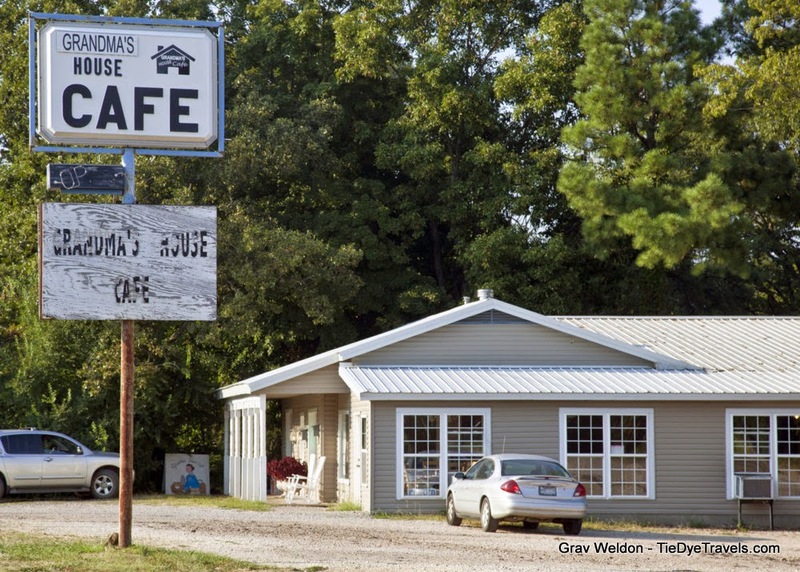 If you aren't in a great hurry to get to Fayetteville, it is worth the trip up the old highway to eat at Grandma's. I have eaten there several times. It is good ole country cooking at it's finest! I have traveled a great deal to most U.S. major cities with my work over the past 30 years, and thought I had eaten at some of the best restaurants for the money. But none of them can top Grandma's House Cafe for the money. What a find. Simply outstanding food. Talk about a hidden treasure. I have eaten at what I thought were pretty outstanding restaurants for the money in most of the major cities of the U.S. over the past 30 years when traveling in my job, but none of them can top Grandma's House Cafe for the money. What outstanding food for such a small price. Talk about a hidden treasure.